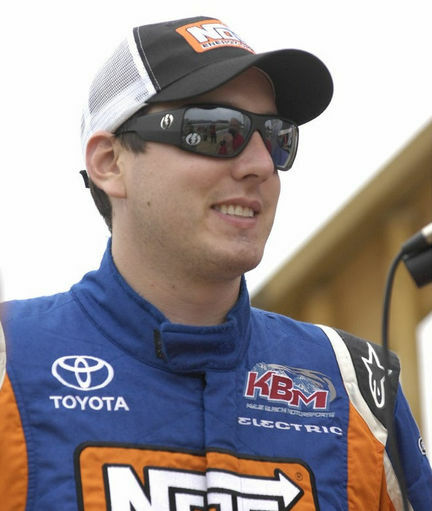 After having to start at the back of the field due to pre-race engine repairs, Kyle Busch charged his way through the field to win the Camping Word Truck Series race at Bristol Motor Speedway. His only pit stop came on lap 30 which caused the driver and the crew chief to have fuel worries when a green-white-checkered would be the final laps of the race. Aric Almirola was able to capture the second place spot, followed by Ron Hornaday who rallied from spinning earlier in the race and going a lap down. On lap 198 Ken Schrader was unable to avoid a spinning David Starr slamming into him and putting both drivers out of the race. Schrader was able to walk away from the incident, but with a pretty significant limp. Elliott Sadler and Timothy Peters were battling for second in the closing laps of the race when Sadler hooked the right rear of Peters’ truck sending him spinning. Several laps later Sadler hit the wall with a flat right front tire. Peters was able to finish out the night with a top ten finish. On the final lap of the race, Matt Crafton pushed rookie Austin Dillon down the straight away and into the corner causing him to spin and collecting two other trucks. After the race a little yelling and screaming went between Dillon and Craftons crews. The up and comer everyone needs to watch for is James Buscher in the number 31 truck. He was running in the top 5 before he was in an altercation with Jennifer Jo Cobb. This kid has been running with those boys and showing some good stuff out there. For a moment there, I really thought he was poised to win the race. So glad you stopped by! Don’t be a stranger! Even Tiger wouldn’t want this much Busch!